And just like that, it’s cold outside. It happens every year. The summer feels like it’s taking forever, and then all of a sudden I need slippers in the morning and we can’t even have the windows open. I’m not complaining. I love this cold, but some soup definitely helps. When we were in Kazakhstan, one of the restaurants served this amazing lentil soup. It seemed like one of the best things I’d ever tasted, especially when we were struggling to find groceries some days. It was so savory and so flavorful, but I still haven’t nailed down what made it so great. 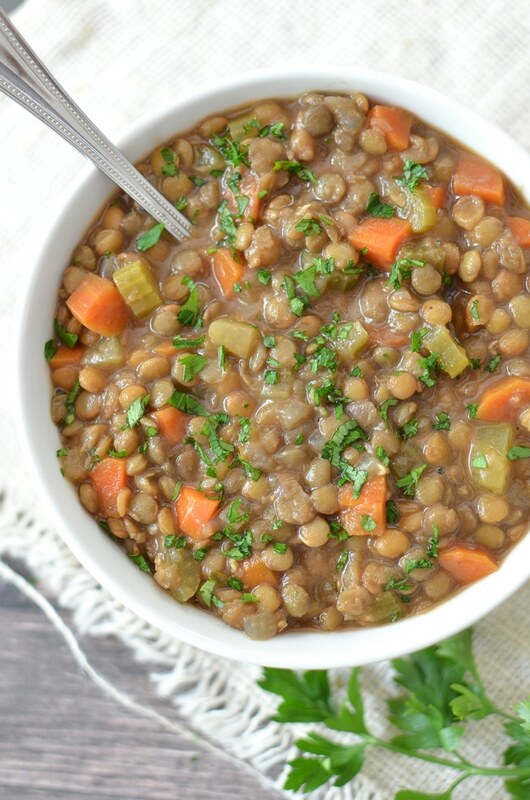 Even this slow cooker lentil soup doesn’t compare, but, it’s amazing, in it’s own way. I’m starting to think there was something a little sketchy in it, like an insane amount of MSG or something. Either way, this soup is insanely easy to make, and it’s hearty, making it perfect for fall. I made this and we ate it for lunch all week. Place all ingredients in a slow cooker, stirring to combine. Cook on low for 8 – 10 hours (or high for 4 – 6). Remove bay leaf and thyme stems before serving. My goodness, Melissa! 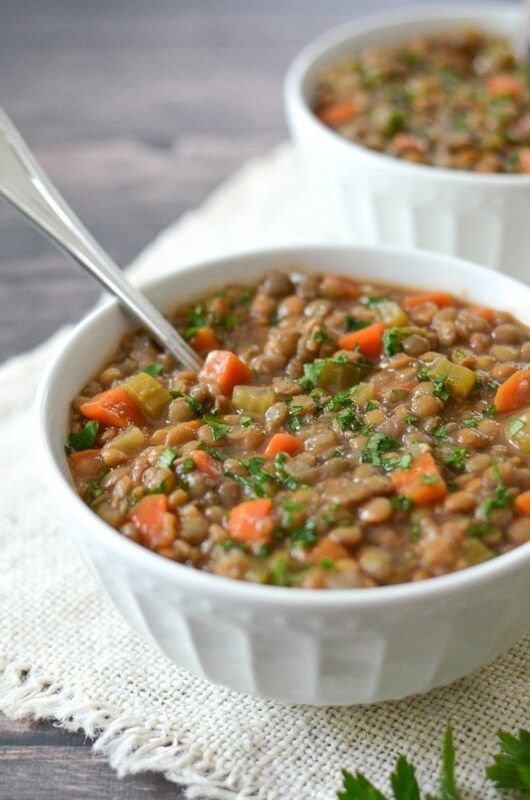 These lentil soup pictures are absolutely stunning! 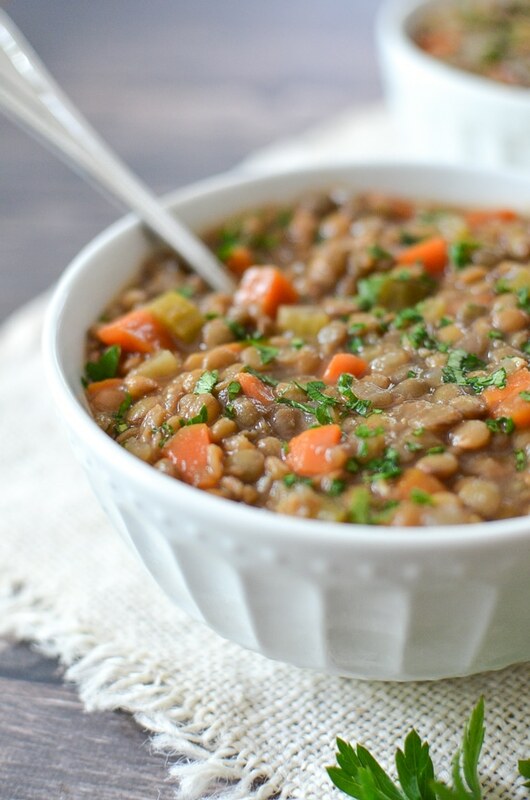 I always find it hard to photograph bean-based soups and stews but you have really done justice to the deliciousness that is lentils. The recipe sounds easy and tasty too! Thanks Shannon! They are hard to photograph. Some how they turned out, but this was such a last minute recipe, I’m surprised they did. It always turned out that those have the best pictures, doesn’t it? I made it! Its great. Even the kids liked it. Thank you. I would love to try this. what kind of lentils did you use? Just regular brown lentils. I used a generic brand that I found at my grocery store. 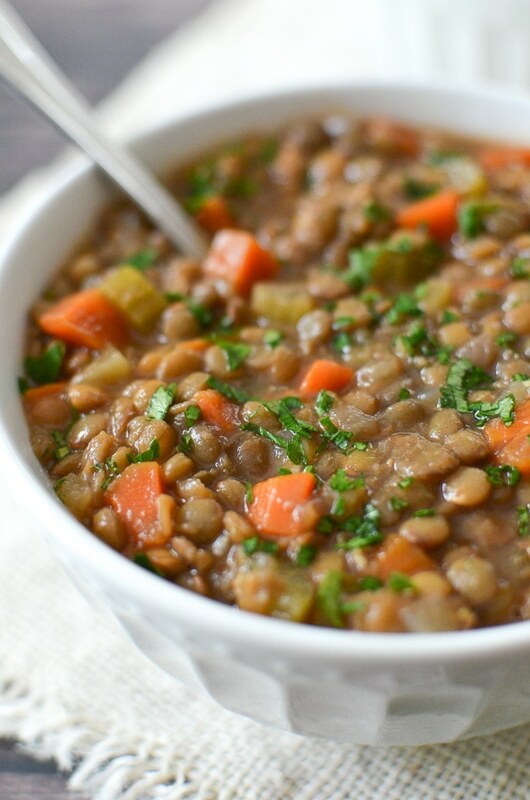 I;m new to using a slow cooker – I see There is not mentioning of soaking the lentils overnight, can I assume I don’t need to do that because of the length thei are in the slow cooker? You’re right. You don’t need to soak them overnight because the slow cooker will take care of everything! Enjoy! I love my slow cooker. Set it and forget it. 16 cups (4 quarters) seems like a lot – not sure my cooker holds that… am I misreading your directions? hoping to make it tonight for tomorrow 🙂 Thanks so much! I have a 6 quart slow cooker, and it almost fills it up to the top once it’s cooked. Most slow cookers are 6 quarts, but you should check to make sure yours is. So very good! I added some sweet Italian sausage & a whole box of broth to thin it out some. Added a bit more cumin due to extra liquid. Husband did a backflip! Vegetable or beef broth, whichever suits your diet better! 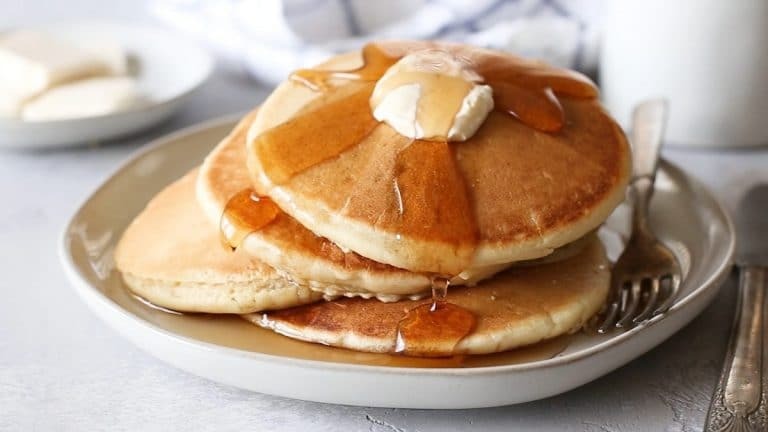 Planning on making this tomorrow! Any nutritional information? Thank you! I’m sorry. I’m not providing nutrition information at this time. When I find a solution that seems reliable and accurate, I would be happy to, but I’m still searching for the right tool right now. Sorry I can’t be more helpful!